Whether you are headed to the local motocross track, or hitting the trails, dirt bike insurance is a very important insurance product to look in to. Having your dirt bike stolen or damaged beyond repair can be a very costly and disappointing experience without insurance. Gould Insurance can assist you in getting the right coverage for your specific motocross needs. We can help insure your motorcycle or dirt bike against; theft, liability and damage. It is also important to know that in most cases you can insure your dirt bike for significantly less than you can your motorcycle. If you are looking for dirt bike or motocross insurance, look no further than Gould. 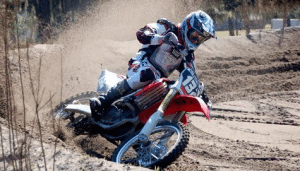 At Gould we have motocross track insurance programs available for track owners across the state of Florida. Motocross is a dangerous and litigious industry. As a track owner it is important to have complete coverage to ensure the safety and prosperity of your operation.